At the end of 6th grade, I was cut from the school soccer team. In retrospect, it was an insignificant event but at the time I was crushed. All my buddies were still on the team, scoring goals, going to practice and getting in shape, while I stayed home and played PS2 and ate popchips. It was a tough period, and my mom tried everything to get me out of it. “I don’t want to play any other sports, Mom!” I just couldn’t get over it. I didn’t want to play basketball, or go swimming, or run track. I considered myself “retired” from sports at the age of 12. I agreed to check it out this time, feeling a little more optimistic because of my Mom’s encouragement. Feeling too bashful, I decided to watch a class before trying it out, meanwhile my older brother jumped right into the class that very day. So I sat in the basement of a Buddhist Church, and watched a “Judo” class. What a spectacle it was. I was thrilled to see all these big guys flipping each other (I even saw my big bro toss this brown belt who later kindly introduced himself as “Andy”). I was on the edge of my seat the whole time. But what truly convinced me that this was where I belonged, was at the end of class, when all the students laughed and gave each other high-fives after an hour of battling it out on the mat. I mean, there was such a sense of camaraderie, that I couldn’t wait to get out there. And so I told my mom she was brilliant, and showed up for my first class the next week. 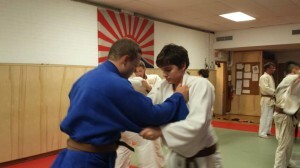 I thought it was so awesome, I had to come back for more Judo. 4 years later, and I keep coming back. I now assist Sensei in teaching the Children’s Judo Classes, and seeing the smiles on the faces of young judo practitioners very much reminds me of the thrill I felt when I first walked into the Kokushi Budo Institute. Suffice it to say, I feel just as genuinely excited about Judo now as I did those 4 years ago, and I don’t expect that to change.